Outdoor Innovations has the ability to create one of a kind landscapes using state of the art Dynascapes CAD design software. With a custom landscape design from Outdoor Innovations, you can be sure your yard will be the envy of all of your neighbors. Here is an overview of our typical process, from initial meeting all the way to project completion. Schedule On-Site Meeting – Discuss landscape needs vs. desires, talk about budgets – sometimes landscaping can be set into phases, discuss future goals, any particular problem areas or areas that need to be addressed. Talk about FREE landscape design possibilities. Base Plan Measurements – Measure the intended project area. Find lot lines, take into account all features of the landscape that are staying, take notes on any ideas discussed in the meeting. Pictures – Digital pictures are taken of the project site and surrounding areas. CAD Design Implementation – This is where your specific project takes shape. All details are included: hardscapes, softscapes, specific site features discussed in the initial meeting. Every item is labeled, and drawn to a specific scale. Color designs are available as well as 3D renderings. Proposal – A detailed proposal is created from the design. All items are included in the proposal so there are absolutely no questions regarding price. Plant List – A plant list is included with the design so you can see every plant you are getting, we have several resources on information for all plants that we can share with you at that time. Pictures for all plants are available as well. Schedule Design Meeting – This is where you get to see your masterpiece. 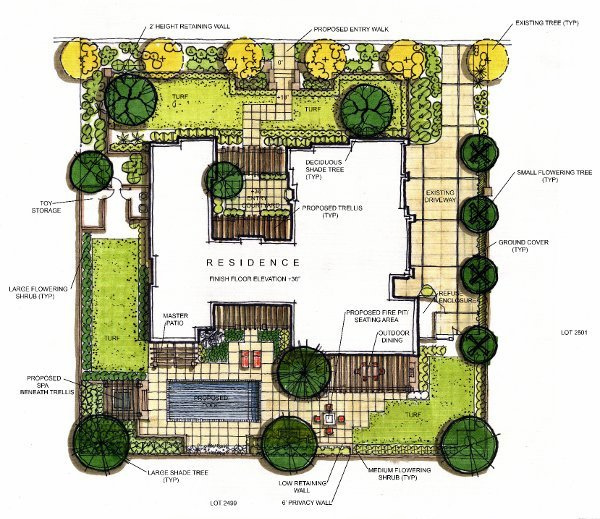 A copy of the design is given to you as well as the detailed proposal and plant lists. Design Walkthrough – We discuss with you in person every detail of the design, how long each part will take, and exactly what each part entails. We also go over the proposal and go over total costs. Questions and Revisions – Any questions you have will be answered. Any revisions or changes that you would like to see will be implemented into a new revised design. Accepted – Once a final design and proposal are accepted, work will be scheduled, and the project will start. Installation – Our professional landscape install crew will install your landscape very quickly and efficiently. We show up early in the morning and work well into the afternoon. You will be amazed how much work we can get done in a day. Our crews always wear uniforms with our logo on them, are English speaking, and are very courteous. The designer of the project is on the job site every day as well, so any unforeseen problems will be addressed right away. Completion – Your new yard is ready! We will do a final walkthrough with you and discuss any questions, or recommended maintenance for your new landscape.